Over 150 participants from IAPO member organizations descended on Barcelona from more than 25 countries including Australia, Bulgaria, Canada, Cyprus, Czech Republic, Denmark, France, Finland, Germany, Hong Kong, Ireland, Macedonia, Moldova, The Netherlands, Nigeria, Norway, Pakistan, Portugal, Spain, Sweden, Switzerland, Uganda, United Kingdom, United States of America, and Uruguay for the 2nd Global Patients Congress organized by IAPO in association with the Spanish Coalition of Citizens with Chronic Illness and the Catalan Rheumatology League. The International Painful Bladder Foundation was represented at this congress by Jane Meijlink, IPBF chairman, who was also a member of the congress organizing committee. The Congress in Barcelona brought together patient leaders from around the world, alongside healthcare representatives, including the global health professionals associations and the World Health Organization (WHO), to work together to develop strategies to bring patients to the centre of healthcare systems. The delegates from disease-specific and cross-disease organizations represented millions of patients with conditions including Alzheimer’s disease, arthritis and rheumatism, asthma, autoimmune related diseases, Crohn’s disease, cancers, diabetes, epilepsy, haemophilia, heart conditions, HIV/AIDS, incontinence, infertility, migraine and headache conditions, multiple sclerosis, osteoporosis, painful bladder syndrome / interstitial cystitis, polio, rare diseases and ulcerative colitis. The congress was the perfect opportunity for networking and making new contacts and delegates took full advantage of this throughout the congress. The theme of the congress was fully supported by participants, reflecting their commitment to effect change through working in partnership to address the main issues considered during the Congress: Patient-Centred Healthcare and Patient Safety. IAPO is calling for the support and collaboration of policy-makers, health professionals, service providers, and health-related industries to endorse and commit to these Five Principles and make them the core of their policies and practice. Speakers on this topic were: Jo Harkness, Policy & External Affairs Director, IAPO; Kathy Kovacs Burns, Past Chair, Best Medicines Coalition (Canada); and Regina Namata Kamoga, IAPO Board Member and Country Manager (Uganda), Community Health and Information Network. The Chair was Sandra Dill, IAPO Board Member; Chair, International Consumer Support for Infertility Patient Leader Network; and Executive Director of ACCESS Australia Infertility Network. IAPO’s Declaration on Patient-Centred Healthcare can be found online, with some references on the impact of a patient-centred approach in IAPO’s publication, "What is Patient-Centred Healthcare? : A Review of Definitions and Principles", available at www.patientsorganizations.org/pchreview. A second policy focus, on Thursday 23 February, lay on patient safety responding to the global problem of patient safety - the World Health Organization estimates that in developed countries, up to one out of every 10 hospital patients experiences an adverse event and in developing countries, over 50% of medical equipment is faulty (WHO World Alliance for Patient Safety, A Year of Living less Dangerously, Progress Report 2005). Speakers were: Martin Fletcher, Technical Officer, World Alliance for Patient Safety, WHO; Margaret Murphy, patient advocate; Yves Juillet, International Federation of Pharmaceutical Manufacturers and Associations; Dr Kgosi Letlape, World Health Professionals Alliance; and Britt Wendelboe, Danish Society for Patient Safety. Stephen McMahon, IAPO Board Member and Chairman of the Irish Patients Association chaired an international panel of policy-makers, patient advocates, industry and health professional representatives that considered the global challenges to improve patient safety. The session raised awareness of patient safety issues such as medical errors, the importance of communication and information to patients and how risks and benefits of medicines are considered. Speakers highlighted concrete initiatives to improve patient safety and during the Congress, education, training and debate equipped and encouraged patients to connect with healthcare systems in a coordinated, powerful and highly effective way to improve safety for all. Margaret Murphy, patient advocate and member of the steering group of Patients for Patient Safety, part of the WHO World Alliance for Patient Safety, emphasised the valuable role that patients and patient advocates play to improve patient safety both on a personal level in interactions with the healthcare system but also by working in partnership with health professionals, policy-makers and others involved in healthcare. Margaret commented, "I am optimistic in relation to authentic, meaningful and productive partnership. Honouring the patient experience requires root cause analysis and accepting responsibility in relation to flawed systems, processes and behaviours. These constitute the first steps in the journey from experience, through learning, to improvement and safer outcomes." Delegates were deeply moved to hear about the circumstances surrounding the death of Margaret’s son caused by a series of medical failures and misjudgements. 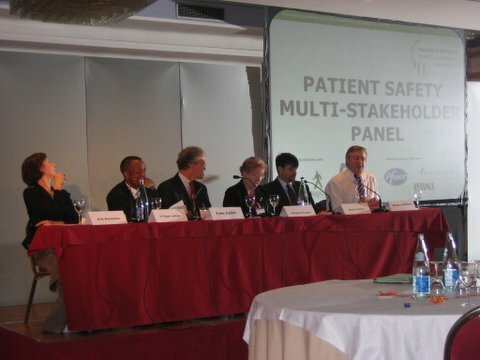 During the session, the need was highlighted for an international concerted effort to address patient safety. "The World Health Professionals Alliance (WHPA) was pleased to participate in this very successful World Congress and looks forward to working with IAPO and patient groups everywhere towards increased international action on patient safety and building a responsible, sanction free healthcare environment", stated Dr Kgosi Letlape, President of the World Medical Association who represented the WHPA at the Congress. In addition to commitment to work in partnership with Patients for Patient Safety, IAPO is concerned about the specific patient safety issues related to counterfeit medicines. IAPO supported the proposal to establish an International Medical Products Anti-Counterfeiting Taskforce (IMPACT) during the WHO International Conference ‘Combating Counterfeit Drugs: Building Effective International Collaboration’ in Rome, 16-18 February 2006. This resulted in the publication of the Declaration of Rome which declared that counterfeiting medicines was a vile and serious criminal offence that puts human lives and risk and stated that WHO should lead the establishment of IMPACT. See also IAPO's Global Patients Congress 2006 Evaluation Report.